What do trust and self esteem have in common? Trust me, it isn’t a trick question…..someone once told me that people who are more secure in themselves, are most trusting of others. Mmmm really…??? 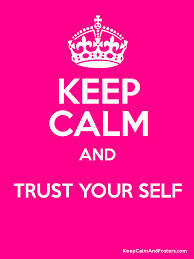 ?How do you become more trusting of others, when you have forgotten how to trust yourself. Which brings me back to the question – What do trust and self esteem have in common…..????? They are both common factors in successful relationships 🙂 ahhh you say…..in all relationships, I hear you ask? Yes – in all relationships; from romantic to business to friendship to self. Pause……my little voice kicks in – what about the relationship with yourself Little Miss Fabulousness? And she is right…..because I had been living a lie for so long; little did I realise how much I had stopped trusting myself and how I had kept missing the subtle hints from the universe/my intuition -that then it decided to deliver a message this week, about my lack of trust in myself, which would cause a chain reaction of events – both physical and emotional! This journey has not been easy over the last 11 months and I never assumed it would be – when you have been lying to yourself for so long and when you change who you are for someone else; the truth hurts. Some answers frustrated me because I couldn’t see them right away; others slapped me so hard that I fell down (which in boxing this week; my ankle gave way and I landed pretty heavily on a mental rode from the boxing squares I had been jumping in & out of….consequence, I moved 2 bones in my ankle…..) – what has this got to do with it? Well the realisation that with a situation from my past; even though I had processed certain parts; the one that my “gut”; my “intuition” keep telling me to deal with – was anger. The anger relating to, another relationship that I had given everything I had; didn’t work… again?!!!????? Which begs the trust question again….however how do I trust myself to deal with it effectively when I have been too concerned about the receptiveness of others if I do get angry or upset or that I am not what they really want and they chose to walk away? As some of you know (or others may not as this may be your first read of my blog) last week an interview that I did was released and it surprised some people; because I had kept so much close to my heart, because of the situation at the time, I didn’t trust that I could say what I was going through and have people still there on the other side of it. The interview was raw; real; unscripted and showed my vulnerable side…….big time! So I want you to get, that it isn’t the anger or people’s reaction that I am afraid of….the truth of the matter is, I have put so much trust in people and had it been shattered so many times recently; that I wasn’t sure how much more I could take. Then you start finding other ways to “trust” again; falling into old patterns; however it is all false and still falls apart no matter how hard you try to make i work; because you can’t have one without the other. Then I started to see around me in people and even little ‘freebie tips & tricks”, that women who get what they want in life, know what their intuition is telling them and that if they pay attention and not just hope for the opportunity,they get out there and grab it – they trust themselves to do it & the results speak for themselves. The last 11 months, I have identified where I am vulnerable; and need to pay more attention to “my intuition” around the choices/decisions, including the facts that I am presented with along side my own research; so that I can make the best informed choice in relation to that situation as it stands; because that is all you can do. So yes; common factors of trust & self esteem are evident in successful relationships within my life – business; friendship and self. Next postTo be showered by Gratitude or to shower others with Gratitude……what do you do!!!??? ?